We are still working on the bike mounting project. It's evolved something like seven times already. We picked up the bikes today - after we bought them yesterday, we left them at the shop so they could put the fenders and racks on (and my bell!). We rode around a bit, went to the hardware store, then back to the truck to figure out what we were going to do. We were in the bike shop parking lot but needed a bigger selection of stuff, so we decided to just put the bikes in the sleeper and head over to the Home Depot we'd been parked at for the last few days. After getting what we needed in the store, we decided to go for another ride before working on getting the bikes mounted. It was still hot - we're in Texas, after all - and I was already sweaty, so I figured I may as well get some wind on me to cool me off. That's the thing about humidity, compared to somewhere dry like Arizona. In Arizona, the air is hot. Like a blow dryer. Arid. An oven. So even when the air is moving, it's still hot. Hot wind. It's miserable. But in a place where it's humid, even though it's hot, once you get that wind going - whether by a fan, a bike ride, or an open car window - the air is cool. It's cooler wind. Until you stop moving. Then you're drenched from the humidity again. After our ride, we started working on the bikes again. Almost two hours in and the sky was getting black. I kept saying to Ed, "It's gonna rain." Then, "Wow. There's a lot of lightning. And thunder. It's really gonna rain." He said, "And?" So we kept working, against my better judgement. I started picking up all the stuff around the bikes - the straps, velcro, chains, rubber tubing, bike locks, lights, etc. - and put them in the truck. I had a feeling that the sky was going to just open up. Then I felt drops. "I feel drops!" I said to Ed. "Well, I don't feel 'em." he said. "That's cause you're moving and I'm standing still. Oooh, there's another one. It's gonna rain." I said. "So you're telling me it's raining over there, on you, but not over here on me?" he said. We were forty feet apart. "I'm telling you I feel drops. Just hurry up, we've gotta get the bikes under the tarp." I said. I swear, I'd make the best damn drill sargeant the military has ever seen. I am bossy AND loud. "Ed! Drops!! I feel drops!! It's going to rain any second now. WHAT are you doing?? Get the bikes, c'mon!" I said. We unrolled the felt pads, Ed standing on the trailer, me on the ground. 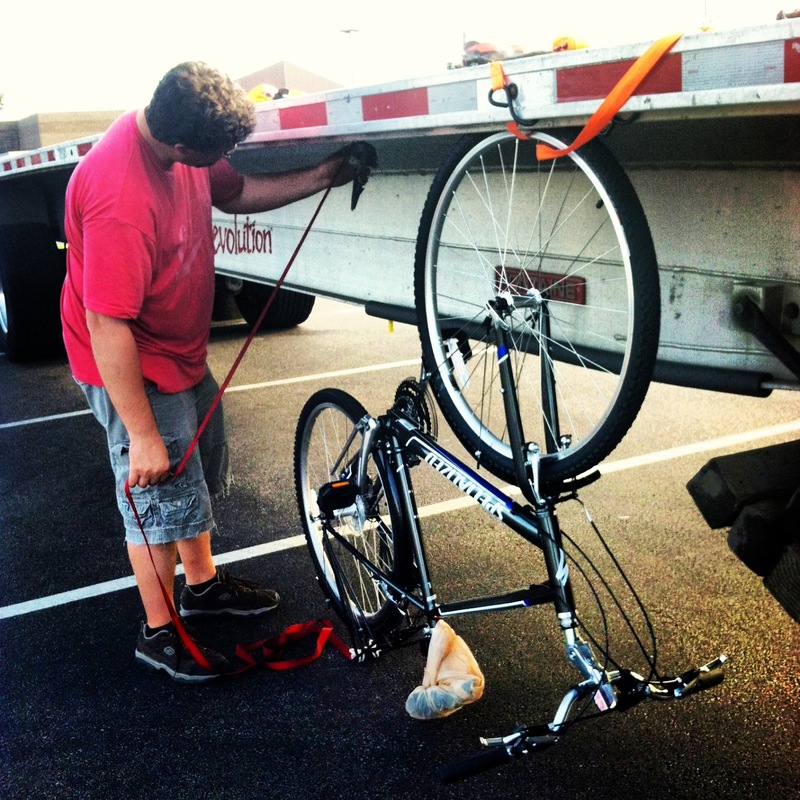 I picked up his bike and handed it up to him on the trailer. The drops were steady now, but small. We put another felt pad on top of that bike, then I handed him the other bike. He placed that one on top and we unrolled the other felt on top of it. The drops were getting bigger. Then we put the tarp on, frantically trying to cover all edges, and the sky opened up. Torrential rain. Biblical rain. I ran to get my umbrella, which turned out to be mostly useless. We ran to get bungees, Ed opening the side box, me holding the umbrella over our heads. Our backs and legs were getting wet. My feet were completely underwater, my leather ballerinas sucking up water. We finished as a bright flash lit up the sky. The bikes were covered. Dry. We got back in the truck, peeled off our clothes, twisted the water out of our shirts and my capri pants, put our soaked shoes on paper towels up front. And it was still raining. We were clearly done for the day. We've been here nine days already, and probably won't leave until Monday or Tuesday. We'll ride more this weekend and finish mounting our bikes. I think we've almost got it figured out. Our biggest issue at this point is a bike cover to keep the road schmutz off the bikes. We have an idea, I just don't know how it's going to work yet. And for once I'm hoping it'll be sunny and dry. 9 days to get loaded?? ?..that's some layover. Who's loading the trailer??? At least your in your favorite state! Working smarter, not harder....gotcha.. Looked like you guys last went to a refinery, so you must be in the Houston area. Should be freight there, but it's a puzzle about what pays enough and gets you where you want to go..without the cost to deadhead. Have fun with the bikes, the weather is nice this time of year..hope you guys get out by July! Scott there are tons of loads out of the south Texas area and we will get one soon. Every time we try to do something to the truck it ends up being some week long project. It turns out, no one makes anything for our truck or trailer that does exactly what we need it to do. Everything is custom and needs to be fabricated. And you can't fabricate anything without a plan. We are now looking at having a custom box made to store them, but that will take some time if we head that route. Thanks for reading. I hear that...projects always seem to take twice as long as you figure. Enjoy reading both your blogs. I know you guys spend a lot of hours driving and working on the truck, so thanks for taking the time to write about the industry and travels. Lay on the horn if you pass this way.